In this meat-and-potatoes part of our great country, it seems particularly fitting that the most visible feature should be called Big Mac. We’ve already had fun with you about the Mackinac Bridge, but we keep coming back to it and thought you might enjoy it again, too! 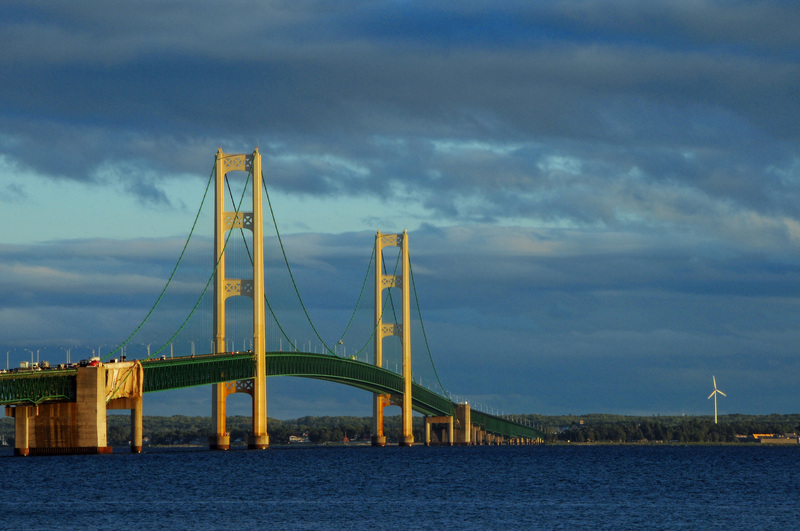 The Mackinac Bridge is currently the third longest suspension bridge in the world…. [and] the longest suspension bridge in the western hemisphere. 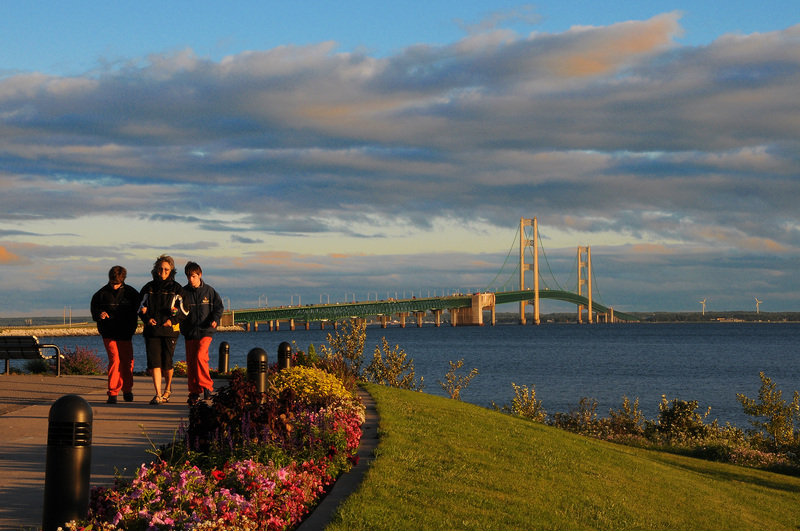 The total length of the Mackinac Bridge is 26,372 feet. The length of the suspension bridge (including anchorages) is 8,614 feet. The length from cable bent pier to cable bent pier is 7,400 feet. Length of main span (between towers) is 3,800 feet. That center section of roadway between the two towers is almost 3/4 of a mile long! The whole bridge is just 28 feet short of 5 miles long. This November 1 will mark the bridge’s 56th year of operation. Approximately 4 million vehicles cross it every year. It is open all year, even when the Straits of Mackinac freeze solid beneath it. The bridge authority says the pavement in the center span is designed to move from one side to the other as much as 35 feet with enough wind! They point out it would not sway, but would gradually move that far until the wind subsided, when it would gradually return to center. A Yugo was blown off the bridge in strong winds some years ago, when its driver stopped on the inside lane that has a metal grate and a stronger gust blew up from below! 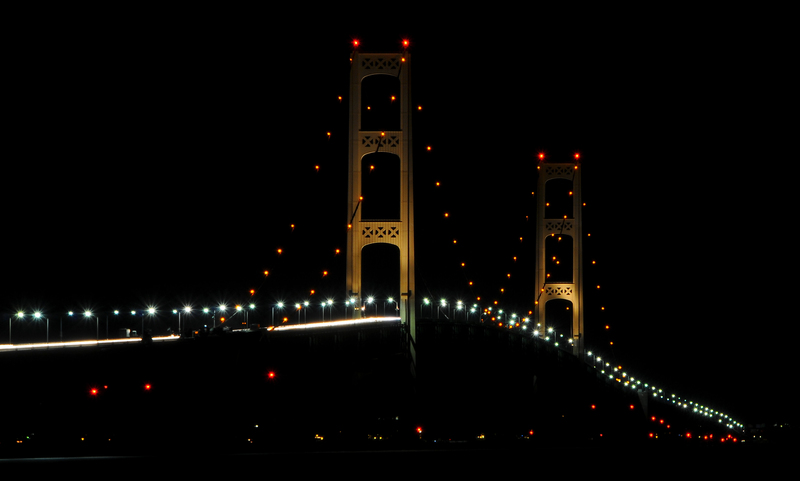 Mostly the Mighty Mac is a large but graceful figure, observed and admired from many angles and from many distances, both day and night. you guys should wait around for Labor Day and walk the bridge when it is open for walking. We’ll still be in Petoskey! A little challenging with Ross & Ryan…. My sister r up in Mackinaw land this week! Wonderful time to be here!